If you are a car camper, you probably bring a lot of stuff along for your camping trip. Organization and cleanliness are essential for happy camping and keeping the animals at bay. Personal belongings can be brought in a suitcase, backpack, or duffel bag and left in the tent or back of your car or truck. When you remove something, always be sure to put it back where you found it after using it. Trash accumulates quickly over time. Be sure to bring plenty of large, heavy-duty trash bags. Bringing a collapsible garbage can helps provide a secure location for your trash if the wind picks up or little critters come searching. Having a separate recycling bin is also advised, as often drinks in glass or aluminum are enjoyed in large quantities. Each morning after waking, straighten your sleeping bags and other personal sleeping items so everything is where you want it when you go to sleep. Remember by then it will be dark, and you will want to just crawl into bed. The kitchen tends to be the hangout on a campout. Keeping it clean and organized with a portable camp kitchen is essential. With a quality camp kitchen, you can store all your kitchen gear and dried goods in one place. There is a place not only to cook but to clean. Clean up soon after enjoying each meal, putting everything back in its storage space. When fires are not banned, campers tend to collect wood for the campfire. Be sure to set aside a space not too far from the fire where the various-sized pieces of wood can be kept. Under a tree is good so people aren’t tripping over the wood in the dark. The tree will also protect the firewood from the rain. 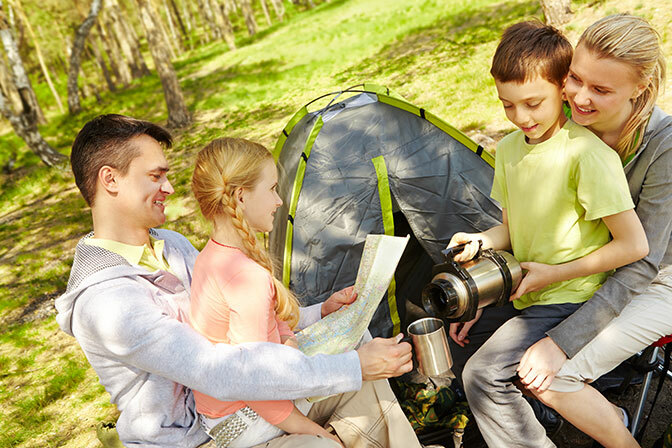 Camping is a time to relax and enjoy the natural environment. When either sitting and reading or hiking and fishing, be sure to put all your wrappers from sandwiches or snacks either in your pocket or backpack and dispose of them in the trash bin when you return. Never drop trash on the ground for someone else to find. Before you leave your campsite, pack out or dispose of trash and recycling in proper bins. Be sure to check your campsite for any forgotten belongings or stray trash. Having a clean and organized site while camping also makes packing up to leave a breeze.